For sandwiches, sliced bread is great, soft rolls are wonderful. But sometimes nothing but a crusty roll will do to make you feel like you’re holding a meal in the palm of your hand. And sometimes it just needs to be a ciabatta roll, with those nice big holes to harbor whatever filling is your pleasure of the moment.. But I confess I had more than good eating on my mind when I made these particular rolls. 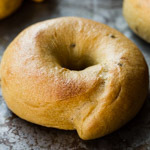 The high-hydration (i.e., wet) doughs that produce those accommodating holes can be especially difficult to handle, and I’ve always relied on my trusty mixer to see me through. I was curious to see, here in this bare-bones kitchen where all the mixing is by hand (and all the yeast is wild), whether I could pull it off. In retrospect I could have used a little more water and maybe one more fold, because, although the crumb was pretty open, I’d have liked it just a bit more so for a ciabatta. All in all, though, I was pretty happy with how these turned out. I’m not saying I’ll mix all of my high-hydration doughs by hand from now on, but it’s good to know I can if I want or need to. These rolls are my submission for this month’s BreadBakingDay, hosted by Aparna (My Diverse Kitchen), who has chosen “Small Breads” as the theme of the month. Thanks to her and to BBD’s founder, Zorra (1x umrühren bitte), for another great event whose roundup I’m eagerly anticipating. In a large bowl, combine flours, salt, olive oil, starter, and about 280 g of the water. Mix with your hands until the ingredients cohere. 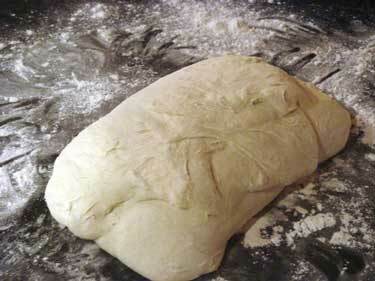 Turn the dough out onto an unfloured counter and mix (knead) until the gluten reaches a medium-low level of development. This took me about 10 minutes. Return the dough to the bowl and add the rest of the water, mixing by hand until it is completely absorbed. Add additional water as needed to make the dough very soft. 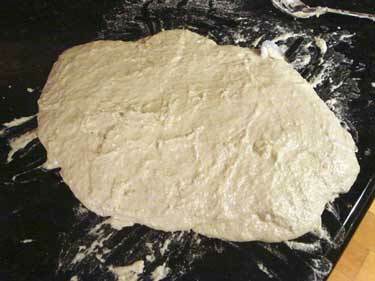 After two hours, place the dough into the refrigerator overnight. 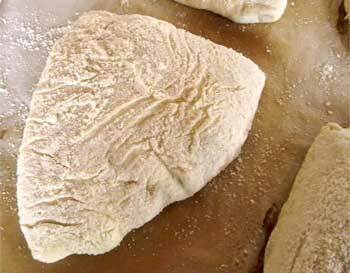 After 7 – 12 hours, remove the dough from the refrigerator and let it warn up at room temperature for about 1.5 – 2 hours. Dust your counter heavily with a 50/50 mixture of flour and semolina flour. Carefully turn the dough out, taking care to degas it as little as possible. 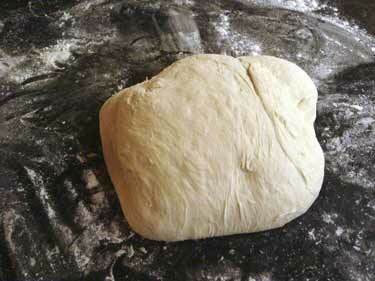 Starting at the center, gently stretch the dough out into a square about 1.5 – 2 cm in height. 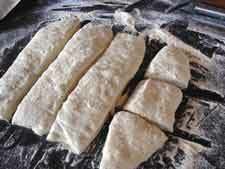 With a dough cutter, cut the dough into 12 pieces. 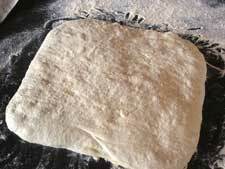 Gently transfer the dough pieces, keeping the flour side down, to a couche that has been heavily dusted with the flour/semolina mixture. Cover and proof at room temperature for about 1 hour and 45 minutes. The rolls should be very light. To bake, slide the entire parchment onto the baking stone. Once the rolls are in, turn the oven down to 450F. 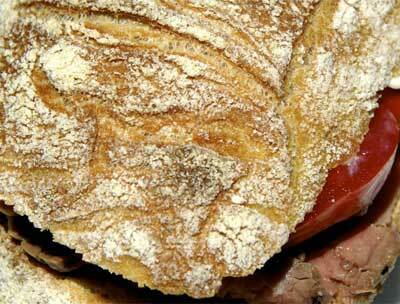 Bake with steam for 5 minutes, then another 15 – 20 minutes without steam. When the crust is as brown as you like it, turn off the oven, crack the door, and keep the rolls inside for another 5 minutes. Susan, I only keep a 100% rye starter, because I like rye in my bread, but would this work ok for these rolls, or should I use it to inoculate a white starter instead? Last time I tried to make a white starter from the rye starter, it went all acetoney and so I chucked it, and it has made me nervous. I was the same as you, depending on the mixer for doughs like this… but then I tried the method of pulling up the dough, slapping it down, folding and grabbing it on the side, etc… I totally fell in love with the technique because you feel the dough developing and can sense when to stop, relying on subsequent folds to finish off the gluten development. I think I really like the physical pleasure of it as well. Lots of movement, lots of noise, and awe-filled kids staring at my business. So, I haven’t gone back to the mixer! 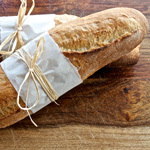 Oh, and making baguettes with this method is a dream as well. Don’t know if I’d do brioche, though. In any case, your rolls look absolutely perfect! And you have the pleasure of saying “I made them with my own two hands”. Susan, I’ve always had trouble with getting an open crumb on my ciabattas. I’m excited to try this technique. I’m also excited to try some of the rolls as a nice alternative for burger buns! Your rolls are absolutely gorgeous. Thanks for another inspiring entry. I love it! I, too, rely on my KA to mix these really wet doughs, and it’s good to see how they turn out by hand. Susan, beautiful mini-ciabattas! And I agree… the double hydration method is the way to go for hand mixing high hydration doughs. Your sourdough rolls look fabulous. 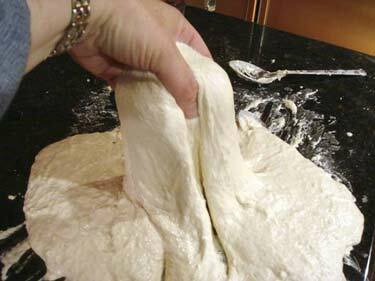 I didn’t know a wet dough could be kneaded by hand to come together this way. I’ve never made sourdough bread but I’ve seen a couple of posts recently that are tempting me to. I’ve always wanted to try the double hydration method for slack doughs after reading about it in SFBI’s book. I was under the impression that it could only be done by machine… Nice to know that it can be done by hand. My absolute favorite bread. It looks delicious! Wish I had one for breakfast. Lynne, I haven’t tried it, but I would not use a rye starter for these unless you are in serious “this probably won’t work but let’s see” mode. The starter here is contributing about 36% of the total flour in the dough, and a 36% rye dough will behave much much differently. You should be able to convert your rye starter to wheat if you start with a small amount and build it up over a few feedings. Jane, yes, although I’ll never give up my mixer there is something incredibly satisfying about mixing by hand. Claire, thanks, and let me know how the technique works for you. These do make very wonderful burger buns. Madam Chow, if you try it with a wet dough I’d love to know how you fare. Aparna, thanks for hosting BBD! Jude, I think you will definitely like the technique. It does work very very well by machine but pretty well by hand too. I’ll try converting again using different flour this time, and keep my fingers crossed that nail polish doesn’t make another appearance.. This looks wonderful! 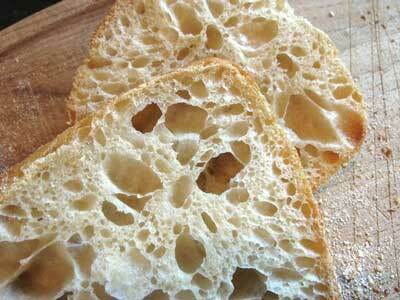 I’ll definitely have to make this- ciabatta has been on my list of things to make for a long time now! 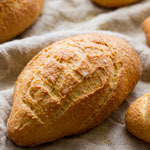 You have to check out this recipe for ciabbatta. I amde it two days ago. I will post on it in a couple of days. So funny because we made our breads around the same time. Anyway check it out. Looks so beautiful! I love ciabatta! I have never baked using a starter but I am really intrigued and willing to dare 🙂 Looks great! Zainab, hope you like it! Erin, thanks, looking forward to hearing how it works for you. Lori, I’ve been eyeing the cocodrillo since it appeared on TFL. Looking forward to reading about yours! Johanna, of course you can do it — go for it! Marjoke, you’re welcome and thanks for letting me know you liked it! There is something so satisfying about mixing slack dough by hand. I must say I’m surprised that you’re not converted away from using your stand mixer, Susan. It’s so much easier to clean hands and a bowl than it is to clean the mixer parts. (Of course, I don’t have a mixer, so I don’t really know that it’s difficult to clean.) And I too am a big fan of the folding over from time to time to further develop the gluten. Needless (no pun intended there) to say, your ciabatta are stunningly beautiful. 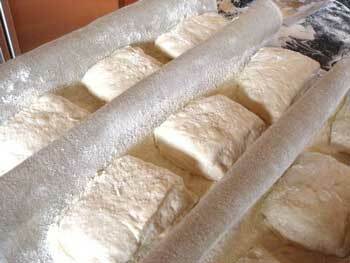 I’d love to have one of those to slice open, slather with pesto and throw on a slice or two of pecorino. Mmmm, heaven…. Beautiful ciabatta rolls—in Italian we would call them ‘ciabattine’ 😉 . 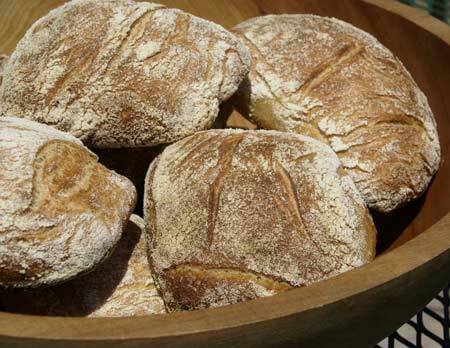 I never tried a sourdough version of this bread, they must taste wonderful! I do not have the privilege to choose yet! As Indians we are so used to kneading for rotis, parathas and samosas with our hands, that I just love getting my hands all sticky with dough:) The rolls look so nice with all those holes! Rather impressive, really. Aren’t hands just marvelous? This is the first time I succeeded in making Ciabatta. And by hand too! I am proud of myself and thankful for your recipe and generous instruction. The sourdough really gives the breads deep and complex flavor. Store-bought ciabatta suddenly taste so blah. I’ve made these on the weekend (although I have to admit that I left out the second portion of the water – the dough was so nicely developed that I couldn’t get myself to start allover again…) and the result was wonderful! Even with less water, nice big, open crumb, very crusty and very tasty! Susan, the first two times I made these, they turned out wonderful! The third time, I made the dough into Ciabatta loaves, and there was big gaping on the ceiling of the bread. Do you have any idea why that happened? Was it because of lack of gluten development? Sledet, it sounds like the dough may have collapsed a bit when you flipped them over for baking. Loaves are trickier than rolls. If you turned them with your hands, try instead holding the baking sheet right next to the dough and lifting the edge of the couche to flip the loaf over onto the sheet. Josh, you have indeed, I used 610 grams. What will happen if i leave the dough in the refrigerator for 18-20 hours instead of 7-12 hours? This will make it easier to incorporate in my everyday life. I am really looking forward to try out this recipe. Well this weekend is a long one here in NZ and I’ve decided to make it my Ciabatta weekend. 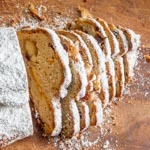 I’m making this recipe along with Ciabatta Integrale from http://sourdough.com/recipes/ciabatta-integrale-wholemeal-ciabatta-multi-grains#comment-12984. And I guess the answer to Martin’s question above would be, that you’d get a bit more tang to the bread, otherwise the extra fridge time should be ok? After you mix the dough and and ferment at room temperature for 2 hours, with folds at 30, 60, and 120 minutes, do you leave the loaf to rise for another 2 hours before putting in the fridge? Rachel, refrigerate the dough immediately after the third fold at 2 hours. Sorry that was a little unclear in the recipe. Hello, i can’t wait to try this recipe. I was just wondering – do you have a sourdough starter recipe? what goes into it? Many thanks! I just made these ciabatta’s. I have a question about the percentage of hydration. You use 355 g water plus 305 g half of the starter and 541 g of flour. 355+305 = 660 / 541 = 122% Is the way I calculate this correct? The first time my ciabatta’s looked like thick pancakes, so this time I used less water. I used: 300 g water + 305 g = half of the starter and 541 g flour. 300 + 305 / 541= 110 %. I thought ciabatta’s used around 80% of hydration. Connie, you are right that the water contributed by the starter is figured in the hydration. However, so is the flour! Therefore, the total flour is 541+305=846, and the water is 355+305=660, making the hydration 660/846=78%. Hi Susan, Hi there! It’s been awhile, hope you are well and doing ok. 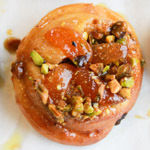 I am very busy, we opened our store a few weeks ago and I am elbow deep in dough from Tuesdays to Saturdays. Things are going very well and the people in this neighbourhood have welcomed a new bakery by coming in daily for their bread needs. 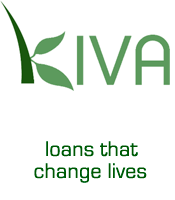 As usual your blog is an excellent resource for me, it really gets the creative juices flowing. This time I am trying to develop some buns and rolls business and finding it difficult to turn great bread formulas into suitable bun and roll production. After perusing your recipe section and reading all of your great notes I felt refreshed. We made a Ciabatta bun made with JH’s Ciabatta with Wheat Germ & Olive Oil and although it baked up tall and very tasty, the interior crumb was tight and dense, funny for a formula with 80% hydration. The big piece cut for the rolls (we call them “heads”) ended up being somewhat neglected while other doughs got worked off resulting an overly extended fermentation time. Anyway, as is often the case, what I read on your blog is info that I already know but have either forgotten or abandoned due to plain negligence. Wild Yeast acts as sort of inspirational corrective-ness…kind of like juvenile detention, but in a good way. Thanks, you have such a great knack. Just made these! Second batch is still in the oven. They turned out great 😀 Thanks for the recipe! In case anyone wonders about the effect of some changes, I made these with my 1/3 dark rye starter, gave them five hours in the fridge, one hour to warm up, and two hours to proof (had to work around a field hockey practice), and they’ve turned out perfect. Can you explain how to do the first fold with the wet dough? I’ve watched the videos and have successfully folded drier dough but when I’ve tried to work with dough that looks like that I haven’t been able to manipulate it at all — it just drips off my fingers. 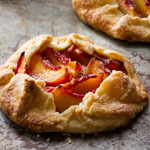 THESE LOOK WONDERFUL BUT I HAVE ONE PROBLEM — I LIVE IN TEXAS AND IT IS IMPOSSIBLE TO KEEP THE DOUGH AT YOUR SUGGESTED TEMPS. — ANY SUGGESTIONS? I know this sounds like a dumb idea but here goes. I make a really good sourdough rye bread pretty much out of “The Bread Bible”. And I make a reasonable good ciabatta – recipe from Hamelman’s book “BREAD”.So I was thinking that if I wanted to make a soughdough rye ciabatta all I would need to do would be increase the hydration from 63%(sourdough rye) to 79% (ciabatta) simply by adding more water in the final dough mixture. Is there anything wrong with this idea? I’m not sure what the website info is it was put in by Dashlane. Anyway I made the bread and am happy mostly with the results. I had some problem in transferring with the board because I didn’t get enough flour on the board so it stuck and I couldn’t fix it but the loaves mostly held their shape and had nice holes, not as nice as yours but any time I get close to your bread I’m happy. I wasn’t clear on the steaming, I sprayed on my cast iron lava rock pans when I first put the loaves in and 2 minutes later. Maybe I shouldn’t have sprayed the second time because the bread never got a nice brown. I left them in and extra ten minutes and then another ten minutes but no joy. The loaves registered 205 after the first 20 minutes. I didn’t bother turning off the oven and leaving the door ajar. The other thing I was disappointed in was the taste. I didn’t find the taste particularly appealing. I asked some of my family who always act as guinea pigs and their verdict was it tasted like bread, not a recommendation. I thought the use of sourdough and the long fermentation would make it really tasty. This was the firs time I did a wet dough and I’m so happy with the method you gave. Maybe my baguettes will come out without flattening. I think I’ve told you before my daughter is a nurse practitioner with chop(Pennsylvania) as an airway specialist. Did you ever mention what field you are in. TRY THIS. 175 GM BREAD FLOUR, 50 gm rye ,25 gm spelt flour, 250 gm sourdough starter, 7 gm yeast,38 gm soy milk, 147 water, 8 gm olive oil, tsp malt extract, 8 gm salt, warm milk, water, oil, mix until dough reaches 28c this takes about 20 minutes. remove to well oiled container rest for 1.5 hours s/f 4 times.final proof 1.5 hours cut into two bake with heaps of steam. do not use flour, when handling this wet dough,only no stick spray and you will have a great open crumb. My dough is too wet to knead and if I add the remaining water it would be a dough any more! what happen? grande polarização em dois grupos. I learned this technique on your site. I have to say, in my opinion, thanks to you, I now have the prettiest burger buns in town. This roll is the finishing touch to a gorgeous gourmet burger. I love your site. As soon as they cool I cut and freeze them immediately. Toss them in a hot oven and they are ready by the time the burger is cooked. Six taste testers were not able to tell the difference between the fresh and frozen. Thank you so much for posting these great recipes and techniques. I was sceptical when I started working the dough because it was so soft. I had made ciabatta a few times previous, but this was my first foray into sourdough ciabatta, and into doing it all by hand.I have just taken it out of the oven and it is beautiful. How satisfying! Thanks so much for the recipe and the careful instructions. Looks mighty good; and I’m SO excited because I’m about to switch the baking game plan du jour of my already “awaiting” starter ferment into this recipe! As a bread-aholic, I must thank you, thank you, for this sourdough Ciabatta! My work hours are such that I need to keep the dough in fridge for 18 – 24 hours. Would that cause any problems? Fabulous blog! For this recipe, I cannot get twelve rolls into my oven at once and will need to bake them in two batches. Do I still turn the oven off for 5 minutes and then restart it for the second batch? I just got them out of the oven, the best looking ciabatta rolls I’ve baked so far. Thanks so much for posting the recipe. Can’t wait to make the pinwheels with Norwich Sourdough.